Minister Yariv Levin says Israel cannot remain complacent about Hamas provocations, believes extensive Gaza operation only matter of time. 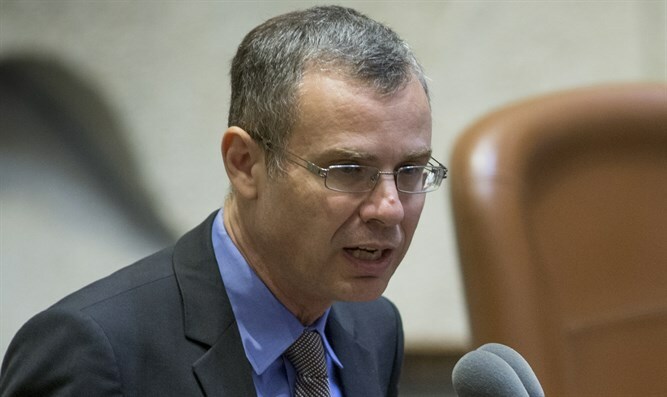 Tourism Minister Yariv Levin spoke to Arutz Sheva about the impending military activity in Gaza and responded to US President Donald Trump's recognition of Israeli sovereignty on the Golan Heights. "We're hitting Hamas all the time, and if there'll be no choice - and we're absolutely coming closer to that point - we'll also embark on a wider military operation. There's no doubt that the operation isn't a matter of 'if' but mainly one of 'when'. "However, I believe it's the responsibility of every Prime Minister to do the maximum to arrive at an operation only as a last resort, I think that's also essential to preserve unity and consensus in the nation, and I believe that every citizen and all citizens of the State of Israel can know with certainty that if there is an operation, it's a war of no choice, and not something else." Asked the respond to the United States' Golan recognition, Levin said, "I think this day is huge, a great historic day, an incredible diplomatic achievement for the Prime Minister, and let no-one have a doubt: This doesn't happen by itself. It's a long process, it's hard work and tremendous diplomatic work, but it's also the proof: The Land of Israel belongs to the People of Israel, and if we persevere and maintain our hold on it, deepen settlement, and stand up for ourselves, eventually also the world will recognize it," said Minister Levin.